I’ve been working on Windows 8 support for 7 Taskbar Tweaker lately. It’s not ready yet, but mostly usable, so I decided to make an early experimental release. This version is designed for Windows 8 Release Preview only, and would not work as expected on earlier builds of Windows 8. It should work well on Windows 7, though. The main issue is the lack of multiple taskbars support. Windows 8 allows you to use additional taskbars on secondary screens. This experimental version doesn’t support this feature, so you’d better turn it off in taskbar’s properties before testing the tweaker. Ctrl+Alt+Tab on double/middle click on empty space doesn’t work. The reason is the new GetCurrentInputMessageSource function introduced in Windows 8 Release Preview, which is used to check the source of the message sent. I’ll have to use another method. With an “Always combine, hide labels” taskbar option, clicking on a decombined group shows the thumbnail preview. I haven’t looked at it yet. If you encounter an issue which is not listed above, please tell me. Get a newer version here. I know 7 Taskbar Tweaker implies a Windows 7 only tool, and you probably expected to see 8 Taskbar Tweaker here, but I decided against it, as I want one program with one name to work on both Windows 7 and 8, both 32 and 64 bit. And because 7 Taskbar Tweaker is already a known name, I decided to leave it. Update: how about “7+ Taskbar Tweaker”? Posted in Software, Updates by RaMMicHaeL at June 2nd, 2012. Given that Windows 8 is nothing more than Windows 7 with extra pain, I think keeping the name is perfectly justified. Thank you! It is the one program I can’t without. Maybe you should cut name and leave only Taskbar Tweaker? That’s great, thanks for update! Holy crap! While I wasn’t looking, you released 7TT for Windows 8! THANK YOU SO MUCH. What about Ultimate Taskbar Tweaker or Windows Taskbar Tweaker? 7 Taskbar Tweaker is misleading. non-beta alpha version 3.4 of 7TT does on Windows 7, which made things easier. even though I have “Never combine” set within Windows own Taskbar Properties. I have to move one of the buttons to make the button labels re-appear. Hmm, are you sure you’re not confusing between Consumer Preview and Release Preview? the Consumer Preview, but has the aforementioned issue in the Release Preview. so that particular setting is not currently enabled in Windows 8 RP itself. In Taskbar Inspector when you change the application ID, is supposed to be a definite change? I mean, on restart application, new ID is applied automatically. This feature is not working on Windows 8 RC here. I’m testing with Firefox Portable pinned to Taskbar. Each new restart I lost the previous config. No, the change is only applied to the target window. Ah, ok. So this feature is useless for me. I was trying it to make possible keep my Firefox portable pinned icon to be combined at one icon when the browser is open. I hope you can find a way to restore previous selected id. 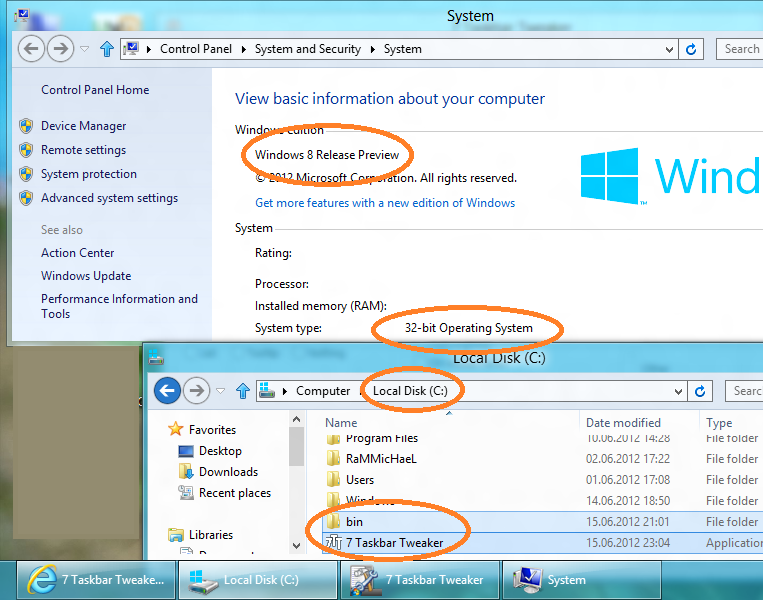 Windows 8 Consumer Preview is still installed in a separate partition. to the root of this partition where I have W8 Release Preview installed. it’s primarily meant to be installed and used on the Release Preview. I could reproduce the issue. I’ll take a look when I have time. Take a look at this screengrab of the issue … does this look right to you … ? I’ve updated the files above, please tell me if it works for you. Thanks … but this one repeatedly crashes Explorer with an “Unexpected error”. Hmm, works for me on both Windows 8 RP 32 and 64 bit. 32bit … files extracted from 7TTW8.zip to the root of the C drive. them separate from regular system files in that area of the drive. version made for and installed upon Windows 7. So, does it still show you the error message? Even after restart and redownload? Thanks a lot! So freaking useful!